Come aboard and sail to Pirate’s Cove… the legendary hideaway of thieving pirates and cutthroat buccaneers. 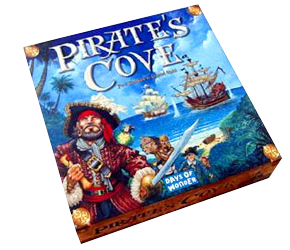 A fun family-friendly pirate game that features spectacular art and production values. If you want to get your friends around for a fun evening of pirate-themed plundering and treasure-burying, then this is the game. You gain fame by winning battles; burying gold and treasure; and bragging about your exploits at the tavern, in true pirate style. At the end of twelve months, the pirate with the most fame is declared the winner. Talking like a pirate while you play is highly recommended.